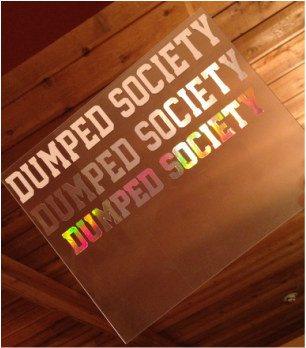 The DumpedSociety Mini Banners are available in White, Brush Aluminum & Oil-Slick. The vinyl is approximately "9.5x1.5" and is packaged safely to prevent bending. These mini banners can be use to tag the front of your laptop, or even the front or back windshield of your car. 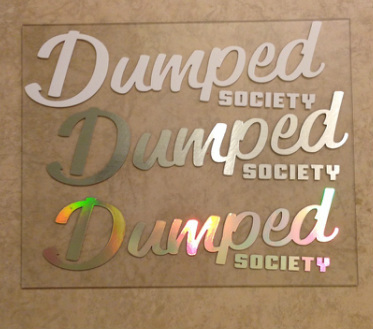 The DumpedSociety Decal is available in White, Brush Aluminum & Oil-Slick. The vinyl is approximately "9x3" and is packaged safely to prevent bending. The "All In One" Decal vinyl is approximately "9x3" and is available in White, Brush Aluminum, & Oil-Slick. 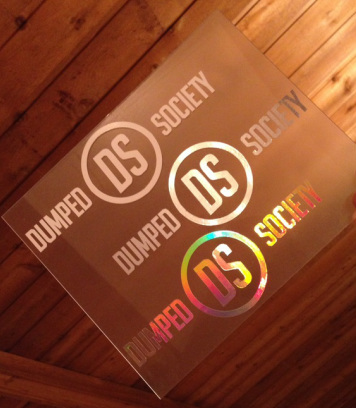 This Decal has the Dumpedsociety name with the Ds logo in the middle. The Decal is packaged safely to prevent bending.